NEAL HOWARD'S studio is tucked away in the picturesque mountains of Western North Carolina. In this special place, surrounded by the endless colors and textures of nature, Neal transforms raw silk fibers into bundles of color. Some of Neal's color comes to you as the hand dyed yarns of HENCEFORTH YARNS. Some of the color is transformed into the hand woven wearable art of NEAL THE WEAVER. Neal's yarns, and her wearables, are the product of great amounts of time, exacting attention to detail, and inspiration driven by intuition. 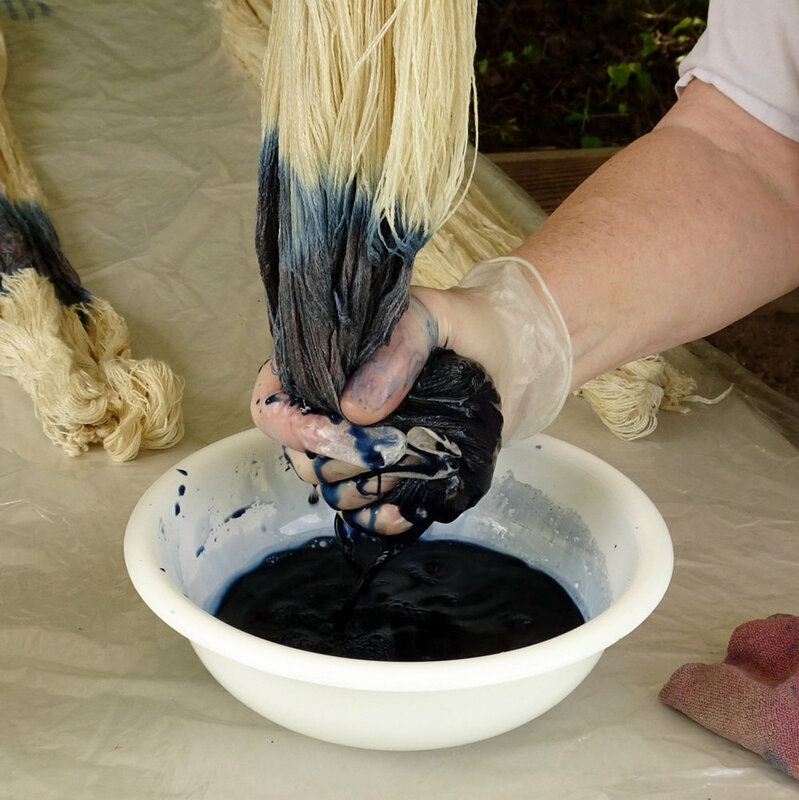 Neal begins with natural silk yarns that she carefully prepares to receive her dyes. After she measures out yarn/warp lengths, she "chains" the yarn to control it while it is soaked in a solution that makes it receptive to her dyes. After the solution is pressed from the yarn, Neal is ready to start the dyeing process. 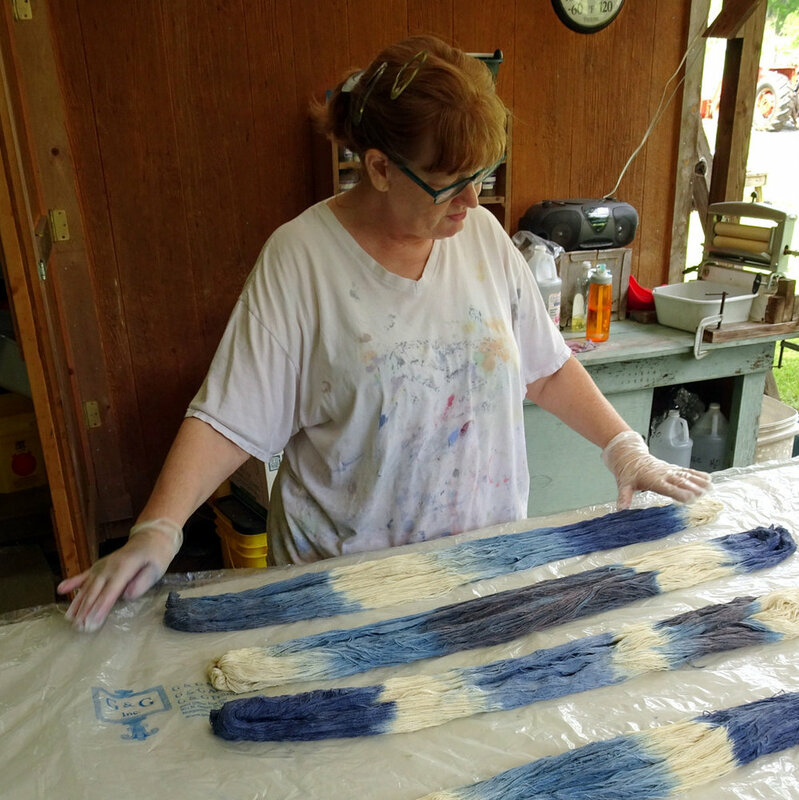 Every step of Neal's dyeing process is done by hand. She custom mixes her colors from dye stock solutions, hand dips portions of the skeins/warps into dye baths, hand works the dye into the fibers, and hand presses the extra dye from the yarn. Dyeing is a very messy process. Neal's mastery allows her to control the placement and intensity of her color with unusual accuracy - this is what gives her yarns, and her wearable art pieces, such stunning color transitions. 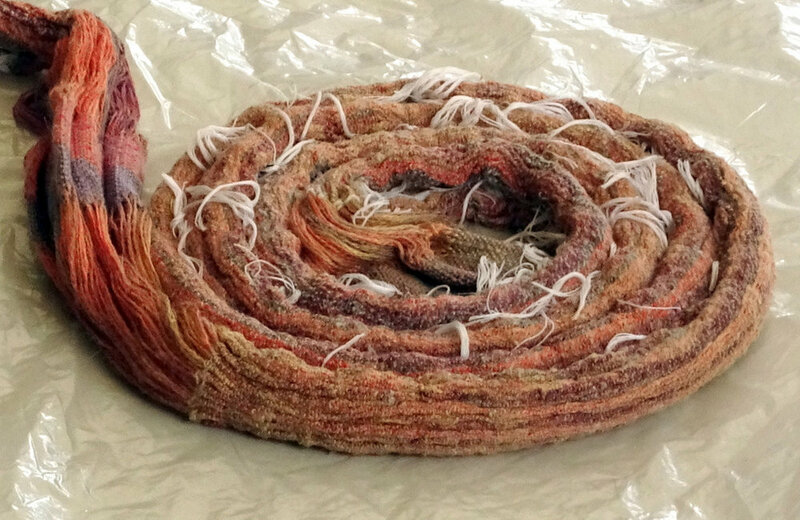 Neal transforms her hand dyed yarns into lengths of hand woven fabric, which she uses to create scarves and garments. She is shown weaving a scarf with a lap held rigid heddle loom. Neal also uses 8 harness floor looms to make larger widths of fabric. 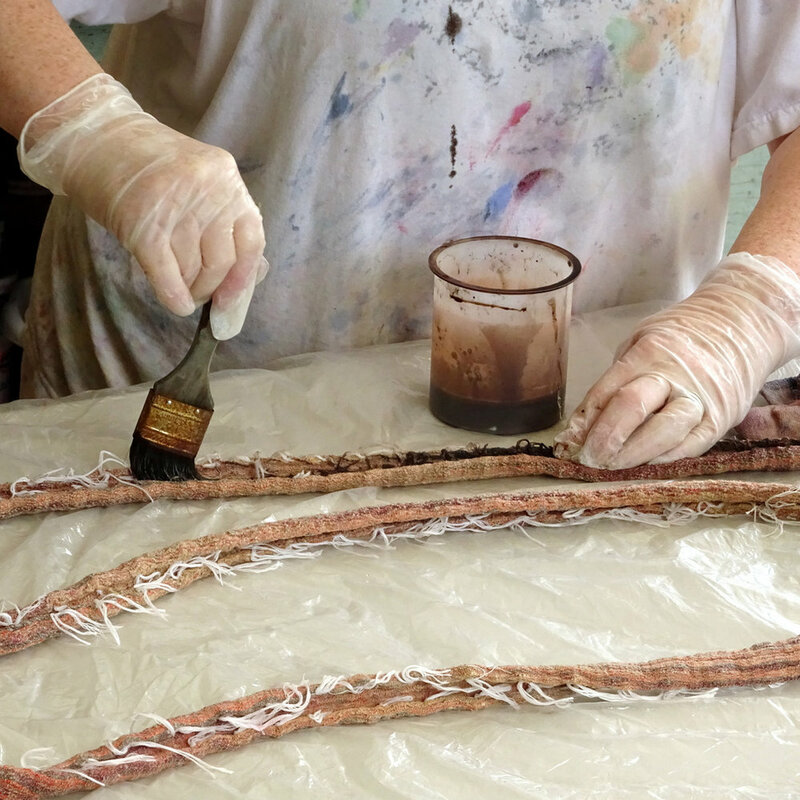 Neal often re-dyes her silk fiber after it has been woven into lengths of fabric. 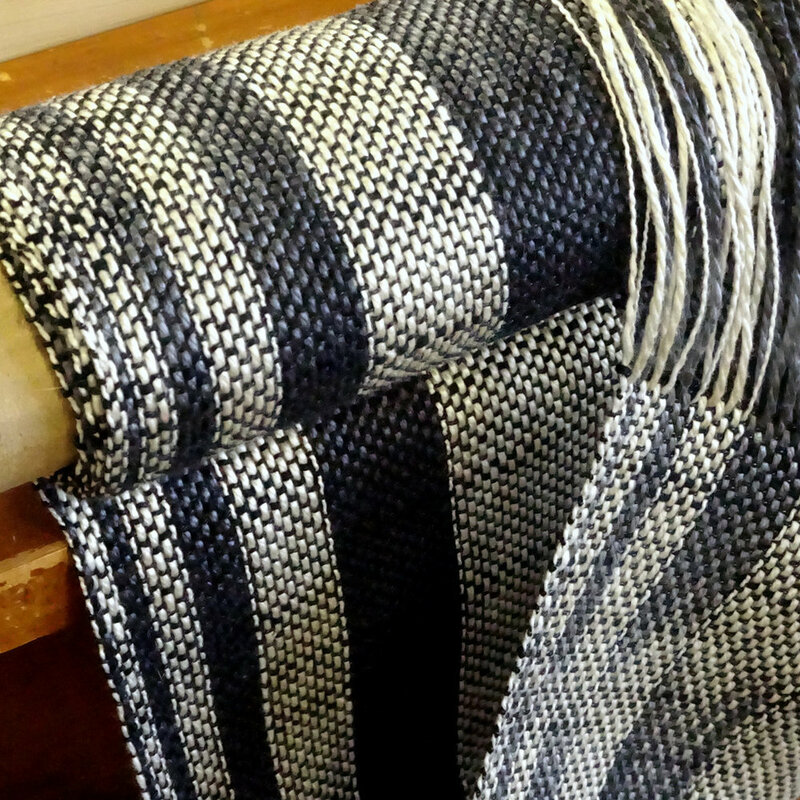 She weaves extra lengths of loose yarn into her fabric which, after the yardage comes off the loom, she pulls tight causing the fabric to gather up. The gathered fabric is soaked and pressed, and then Neal carefully applies the dye by slowly dipping the fabric or painting it. The fabric is usually re-dyed numerous times. 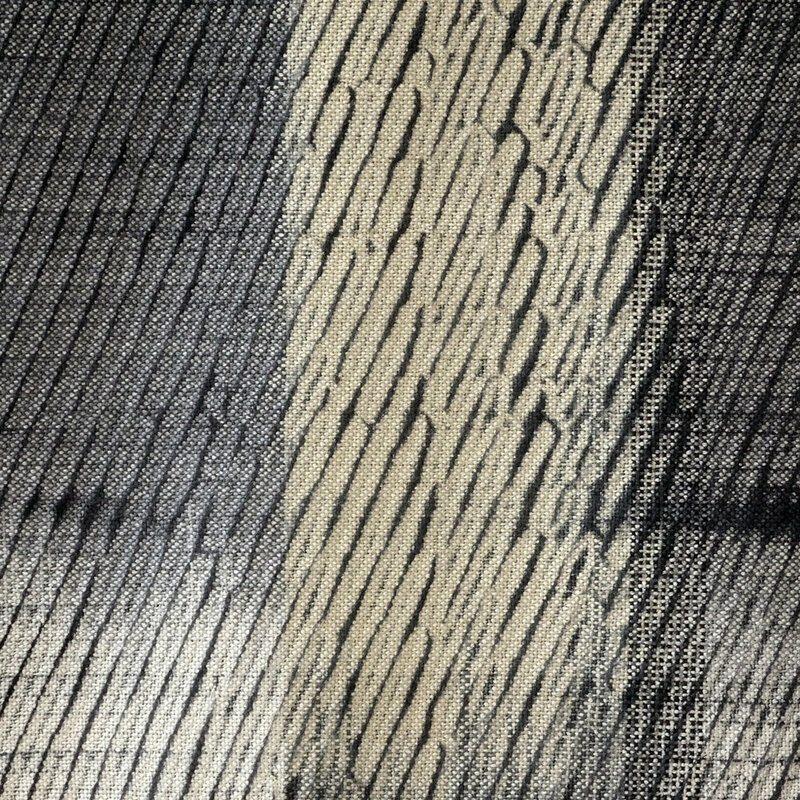 The layers of subtle dyeing result in dramatic patterns that have an unusual sense of space to them - giving Neal's innovative wearable art a unique aesthetic. After Neal completes the dyeing of her fabrics, the fabric is machine washed and dryed, and steam pressed. The premium quality weaving of the light weight silk gives the fabric a lush suppleness. Neal's garment designs make the most of this graceful draping.